I have access to some 370Z manifolds, a very popular turbo kit. I heard people that have this turbo kit specifically might want back up manifolds because they can crack over time. 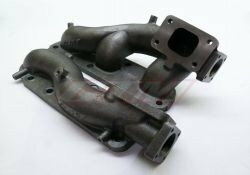 I might be able to sell the cast turbo manifolds to those of you looking to build their own turbo kit as well. I have a great deal on the manifolds and will work on the outlets too. I can probably work a great deal on the Garrett turbos as well if you guys are interested. Here is a picture of the manifold we are talking about. I can't mention specifics on the manifold, but the smart 370z owners can probably figure it out. PM if you guys have interest, this might be a cheap way to build your own. You are going to save a lot of money, but it will take time to build the pipes. no love for the vq35de motors? edit: is that a t2 flange with an external wastegate? Can you still get this manifolds?